Adam Lambert Gives Superman a Run for His Money! You are here: Home / Adam in the Media / Adam Lambert Gives Superman a Run for His Money! While home in Los Angeles less than a week, Adam Lambert squeezed in a performance on American Idol singing not one but two songs, attended and sang at his brother Neil’s San Diego wedding to long-time girlfriend Elisse, and is already back on the road to continue his U.S. tour promoting The Original High. Oh yeah. He also recuperated from strep throat. Nothing short of a miracle! 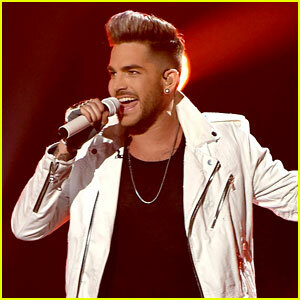 Idolator.com has just published a really terrific interview with Adam fresh off the American Idol stage. Here’s the start & click for more at the end. If you’ve not yet caught on to the fact that Adam Lambert is one of the hardest working guys in show business, consider this: The 34-year-old singer is currently traveling around the States on his Original High Tour, in support of the album of the same name he put out just nine months ago. Once he finishes up on his home turf, Adam heads to Europe for more dates and then summertime festival appearances with Queen. Sandwiched in between there, he’ll shoot his scenes for Fox’s upcoming reboot of The Rocky Horror Picture Show. Oh, and by the way, he just released a new non-album single, “Welcome To The Show,” completely out of the blue a few days back, while somehow still finding empty space on his calendar to jet back to L.A. for a performance of the song on American Idol last week. As always Carol Thanks for the information about Adam! I really enjoyed seeing him on American Idol. Not sure what happened but I only saw him sing one song with Keshi. I think that was her name. Sorry but too much in to looking at Adam to think about her name. She was sweet.I must have went in to the other room and missed a song? I always love anything Adam does. Have fun and take care Adam. Love you! Carol there is a new band coming out that you might want to take a look at. They are rock. The name of the band is ” Rival City Heights” And the name of the very talented singer is Jeff Gutt. You probably missed him because he opened the show singing Mad World when he was on AI then the camera went to Ryan Seacrest saying that was then and this is now and the camera went to the stage with Adam singing Mad World live. If I had not have taped it I probably would have missed it to. It was all before the judges were announced. I have been following Adam since DAY 1 in 2009. Adam can do no wrong. But I am still waiting for some Rock N Roll. There is time so I am hoping he will do that on his next album. He’s a busy guy because he’s such a wonderful personality and extra talented! Ok , so what song did he sing at his brothers wedding ? SO EXCITED THAT AMERICA IS FINALLY WAKING UP TO THIS MAGNIFICENT TALENT!! WHAT A UNBELIEVABLE VOICE HE HAS!!! AND HE KEEPS GETTING BETTER & BETTER!!! GO, ADAM, GO! !